I won’t bore you with all of the details, but the highlight was when I opened my (parked) car door about an inch (really, just an inch! ), and a car driving by hit it, knocking off their side mirror. Ugh. That was when I realized I shouldn’t go out the rest of the day. The Universe however, seemed to feel that being home shouldn’t stop the “accidents” from coming. Next I a lightly brushed (yes, lightly! ), against a glass full of water in the kitchen which pushed it onto the floor and into a million (wet) pieces. Lovely. Days like this are typical when I’m trying to do to much — it’s a wonder then, that there are cars in my neighborhood that still have mirrors, and that I still have glasses in my cupboard! I’d already made the main component of the recipe, the Spicy Serrano-Tomato Preserves, so it was quick and easy. You will see if you make this — and I do hope you do — that it’s absolutely heavenly. It’s sweet, spicy, creamy and refreshing all at once! When our guests arrived for dinner, and I finally sat down and put one of these treats in my mouth — the stress of the day was gone. No, there’s no secret potion involved, just lovely to eat delicious food with people I love. Please note that the prep time does not include the time it takes to make the Spicy Serrano-Tomato Preserves, which would add 2 hours. Making the preserves is super easy, and it's best made ahead of time, as it keeps up to 3 weeks in the refrigerator. Cut the bottom inch or so off of the endive and gently wash the outer leaves with a damp paper towel. Then pull 1 dozen leaves off gently. If when you lay them down, they are super wobbly, use a paring knife to cut a sliver off of the bottom of each one, to create a base. Spread 1 teaspoon of the goat cheese onto each leaf, placing them on a serving platter as you work. Next use add a teaspoon of the preserves, directly on top of the cheese. Add a thin slice of mango on top -- you should make the slices to more or less fit over the preserves. Here's How to Cut a Mango. Top each one with a serrano slice. Though best if assembled just before you're ready to serve, but you can make these up to 30 minutes ahead of time. Keep them refrigerated until you're ready to serve. So sorry to hear about your crazy day! Your appetizer is a fabulous combination of sweet and spicy goodness. I absolutely detest those days! So sorry you had such a bad thing happen with your car, especially. I did three things in a row last time I had my run of back luck: I dumped flour all over me and inside the bread machine and floor (not the right part of the bread machine), then butter expoded all over the inside of the microwave, then I made the pasta I was reheating into burnt offerings. Not a good look for a food blogger, right? 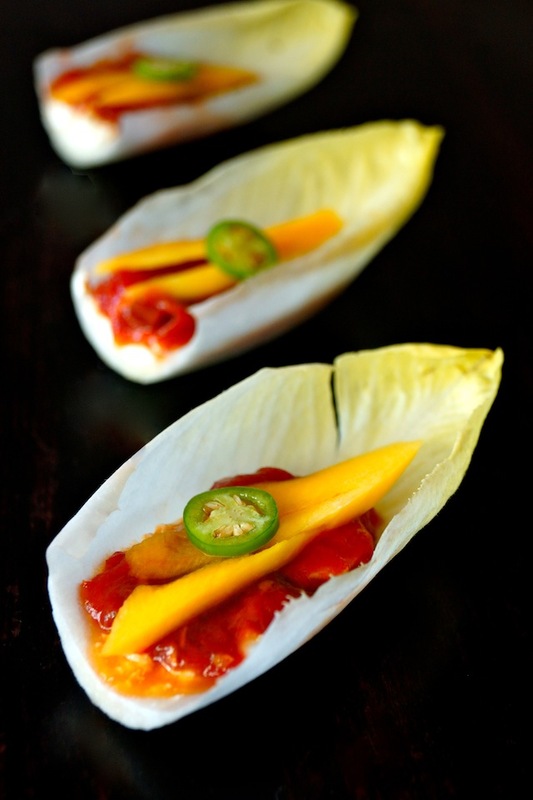 I could see making your recipe using some of my homemade mango chutney – love elegant easy apps for summer! All the images of this recipe look very nice and attractive. I am thinking to try it for my mother. It will be my first time to try any recipe. That’s so sweet. Thank you! I hope you and your mom enjoy it!